Dr. Joseph Henderson, the dean of American Jungian analysts for the past 50 years, died at the age of 104 on November 17th after a brief illness. Henderson was the last living link to a generation who sought analysis with C.G. Jung in Zürich between 1920 and the beginning of World War II in 1939 and who later became analysts themselves. Joseph Lewis Henderson was born in Elko, Nevada on August 31, 1903 of a prominent Nevada family which was active in politics and business in the late 19th and early 20th century. His uncle, Charles Henderson, was Under Secretary of the Navy under FDR during World War I and later became a U.S. Senator from the state of Nevada. Henderson went east to Lawrenceville School in New Jersey where his tutor was Thornton Wilder. He graduated from Princeton in 1927 with a Bachelor of Arts in French literature. Following graduation he returned to San Francisco where he became a drama critic and book reviewer for two small magazines. In 1929 he traveled to Zürich for a year of analysis with C.G. Jung, and he was a participant in Jung's "Dream Seminar" published by Princeton University press in 1984. He entered medical school at St. Bartholomew's in London, graduating in 1938. During breaks in his studies he returned for further analysis with Jung. In 1938 he returned to New York to open a practice of Jungian analysis. In 1940, eager to return to the West Coast, he and his wife, Helena Darwin Cornford, and their daughter Elizabeth, moved to San Francisco where he was a co-founder of the first professional Jungian group in the West. During World War II, he worked at Mount Zion Hospital in San Francisco along with fellow co-founder Jo Wheelwright evaluating returning military personnel from the South Pacific. He taught at the old Presbyterian Medical Center, the former home of Stanford Medical School, as a regular faculty member until the medical school moved to its new home on the Stanford campus in 1959. As co-founder of the Jung Institute in San Francisco, he was twice its past president, and he has been influential in the professional development of many subsequent Jungian analysts in their various endeavors. He also was instrumental in the San Francisco Institute acquiring a large collection of images with their psychological commentary, which became the Archive for Research in Archetypal Symbolism, otherwise known as ARAS. 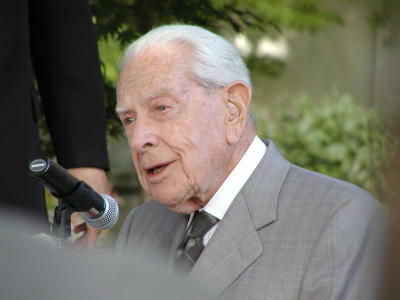 When ARAS evolved into a national organization he served on the board for many years, and at the time of his death he was a lifetime honorary member. He traveled frequently to both England and Switzerland where, after World War II, he continued to see Jung and other colleagues. He was elected Vice President of the International Association for Analytical Psychology in 1962 and served only one term, finding that he preferred writing to political activity. His writings include the following books: The Wisdom of the Serpent, co-written with Maude Oakes in 1963, a chapter entitled Ancient Myths and Modern Man in Man and His Symbols, edited by Jung, 1964, Thresholds of Initiation, 1967, reprinted in 2005, Cultural Attitudes in Psychological Perspective, 1983, a compilation of essays entitled Shadow and Self, 1990, and Transformation of the Psyche, 2003, co-authored with Dyane Sherwood. He has written numerous papers on such diverse subjects as anthropology with special reference to the American Indian, relations between East and West, clinical issues related to transference/counter-transference, aspects of dream interpretation, the use of art in psychotherapy, and alchemical symbolism in analysis. Dr. Henderson developed the concept of the "cultural unconscious", which he introduced in an address at the 2nd International Jungian Congress in Zürich in 1962. This idea has evolved into the hypothesis of the "cultural complex" which has received much attention lately in the Jungian world. In addition, he has written numerous movie and book reviews. He practiced and taught Jungian analysis and analytical psychology from 1938 until his retirement in 2005. He has been a source of inspiration and professional wisdom for many generations of Jungian analysts, and his practice has included significant individuals from many other fields of endeavor. His wife, Helena, died in 1994, and his daughter, Elizabeth, died in 2001. He is survived by two grandchildren Julia Eisenmann and her husband Andy Behman, and Nick Eisenmann and his wife Elizabeth Wolf and two great-grandchildren.